When learning how to make meatloaf, the one most important point I will make is to make sure all ingredients are blended thoroughly. 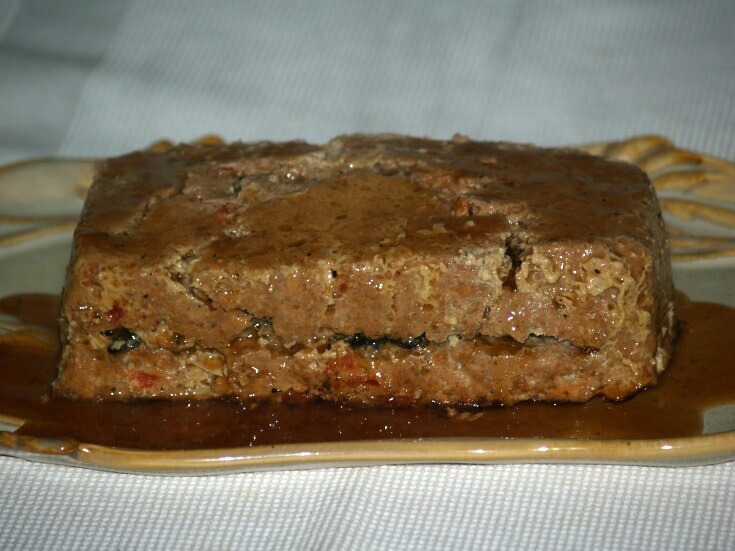 The almost endless variety of meat loaf recipes are delicious when served both hot and cold; cold it makes great sandwiches especially with mustard. I sometimes relate meat loaf recipes to chili recipes in the fact that no two people make them alike. In fact, most people never make these two recipes alike each time they mix them. If you are learning how to make meatloaf, you will find your own favorite ingredients to add to it. They can be made with ground beef, pork or sausage, lamb or a combination of meats. Usually a filler (my term) item is added to kind of bind it together. Some people use rolled oats or other cereals; lately I have begun to use seven grain cereal and I love it. I have used bread crumb or cracker crumbs; these are all good. I have even used ingredients like rice, barley and pastas. They are also good and you might like to try these ingredients. The other ingredients are very important for the flavoring; spices, peppers, tomatoes and onions. The process in which you cook meat loaf recipes determines whether it comes out dryer or moister. Shape the meat and bake in a shallow pan for a crusty loaf; placing a rack in the bottom of the pan under the loaf lets the juices drain away from it. A moister loaf is made by cooking in a loaf pan. By lining pan with heavy foil (and lightly oil), extending above side of pan for handles will let you lift the meatloaf up out of pan. You can also layer dressing between layers of ground meat. Can soups can be used for basting and strips of bacon can be placed over the top; all these adding to moistness. Combine egg, milk and bread crumbs; soak 10 minutes. Add beef, onion, salt and pepper; mix well. Place mixture in a loaf pan or shape into a loaf in a shallow baking pan. Spread ketchup over the top; bake in preheated oven at 350F degrees for 1 hour. SUBSTITUTION: Ground pork may be substituted for half of the beef or try equal amounts of beef, pork and lamb. Tomato juice may be substituted for the mi8lk or for dryer loaf reduce or omit liquid. If you are planning to use the loaf cold, add some chopped boiled eggs, olives or pickles. LAYER MEAT LOAF by putting half of mixture in loaf pan, top with 1 cup cooked peas and 1 cup diced carrots mixed; top with remaining meat mixture. PINWHEEL LOAF can be made by spreading meat mixture on piece of heavy wax paper 8 X 10 inches. Mix together 1 ¼ cups cold mashed potatoes and ¾ cup pureed peas seasoned with salt and pepper; spread on top of the meat. Roll up jelly roll style and place in shallow baking pan; spread chili sauce over top. Bake at 375F degrees about 45 minutes. 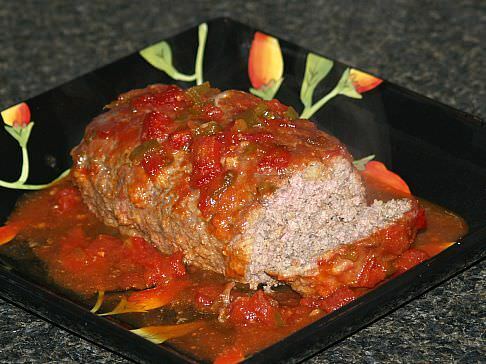 How to make meatloaf Italian style is very flavorful. Sauté onion in butter until tender. Combine stuffing and beef broth in large bowl; add all ingredients EXCEPT tomato sauce and oregano. Mix mixture well and shape into loaf and place in shallow pan; bake at 375F degrees for 30 minutes. Pour tomato sauce over the top and sprinkle with oregano; continue baking 30 minutes longer. 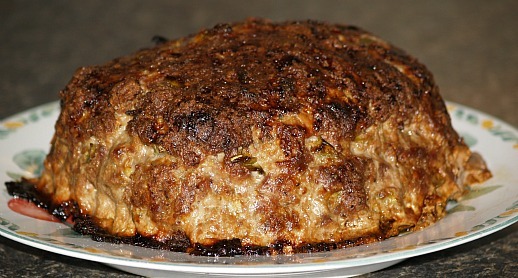 Learn how to make meatloaf suitable for holidays or any special occasion. Preheat oven to 375F degrees; grease loaf pan (9X5X3 inches). Combine and mix all meatloaf ingredients together (I use hands). Melt butter in large skillet; add mushrooms and onion sautéing until tender. Remove skillet from heat; stir in bread crumbs, herbs and seasonings. Press half of meatloaf mixture in bottom of prepared pan. Top meatloaf mixture with all stuffing mixture. Top stuffing with remaining meatloaf mixture; press slightly to even top. Bake about 70 to 75 minutes; cool on rack about 10 minutes. Drain off excess grease; run knife around edges and turn out onto platter. Serve with red wine sauce; serves 6 to 8. Gradually stir wine into cornstarch until smooth. Heat broth in saucepan; stir in cornstarch and wine. Simmer and stir until mixture in slightly thickened. 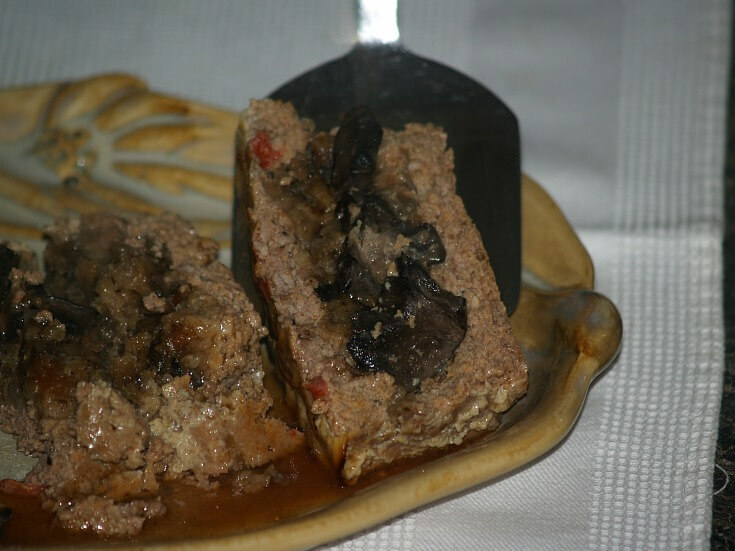 Learn how to make meatloaf with turkey. Combine turkey, grated zucchini, bread crumbs, cheese, parsley, onion, bouillon, salt, milk and egg. Mix well and divide mixture in two parts; press each into 9 X 5 X 3 inch loaf pans. Bake at 350F degrees for 1 hour and 5 minutes; garnish with zucchini slices and bake 10 minutes longer. How to make meatloaf with a sweet and sour twist is not the more well known variations but a tasty one! For sauce combine in saucepan the tomatoes, brown sugar, vinegar, mustard and green pepper; simmer until sugar dissolves and set aside. For loaf combine meat, eggs, onions, cornbread dressing, 2 tablespoons of prepared sauce, salt, garlic powder and black pepper. 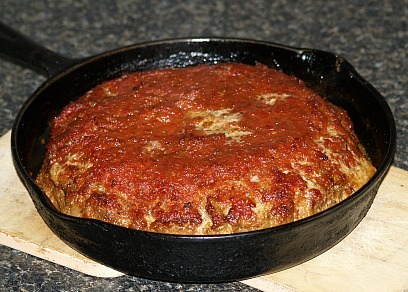 Mix meat mixture well and shape into loaf (or two loaves) and place in shallow pan; pour sauce on the top. Learn how to make meatloaf in an onion. Cook over HOT COALS or PREHEAT OVEN TO 350F degrees. Remove centers of onion halves leaving ¾ inch shell; dice remove centers very fine. In mixing bowl combine and mix beef, fine onions, egg, cracker crumbs, tomato sauce, salt, pepper and mustard. Divide mixture in 4 parts; roll into balls and place in center of onions putting them back together. Wrap each of the 4 onions in pieces of foil. Cook over hot coals for 15 to 20 minutes on each side or in oven for 45 to 50 minutes or until meat is cooked. Combine and blend beef, onion, toast, applesauce, salt and pepper; pack into large greased loaf pan. Combine ketchup, brown sugar, mustard and horseradish; blend well and spoon over top of meatloaf. Bake for 1 hour or until done and center is set; serves 6. Spray a jelly roll pan with cooking oil; set aside. Combine and blend in a large bowl the beef, ½ cup ketchup, mustard, bread crumbs, egg whites, garlic powder and salt. Coat a 15 inch long piece of plastic wrap with cooking spray. Shape meat mixture on plastic into a 13X9 inch rectangle. Spread shredded cheese over meat to within ½ inch of edge. Using plastic to help, roll up meat and cheese into a log jelly roll style. Pinch long seam to seal; remove from plastic and pat into a log. Bake for 50 minutes; remove from oven and spread top with remaining ½ cup ketchup. Bake 10 minutes longer until cooked through.